A palatial mansion, that is a heritage hotel, in the French quarter of Pondicherry with a picturesque courtyard restaurant, check in for a trip back in time. Dating back to the 1790s, Hotel De L’Orient is a lavish mansion, with posh interiors showcasing old-world charm of France and India with an antique touch. Located in the French neighbourhood of Pondicherry, on the Rue Romaine Rolland, the property is a lane away from the sea. Post French-colonisation the property has undergone many refurbishments, from Dutch, British to Indian – however the constant has been the French influence which has been maintained in its architecture. Rooms which are pretty as a postcard, resemble a home – each room bursts with character and a different theme. Rather than boring numbers, the rooms are named after French influenced areas such as Cassimbazar, Balassore or Surate. 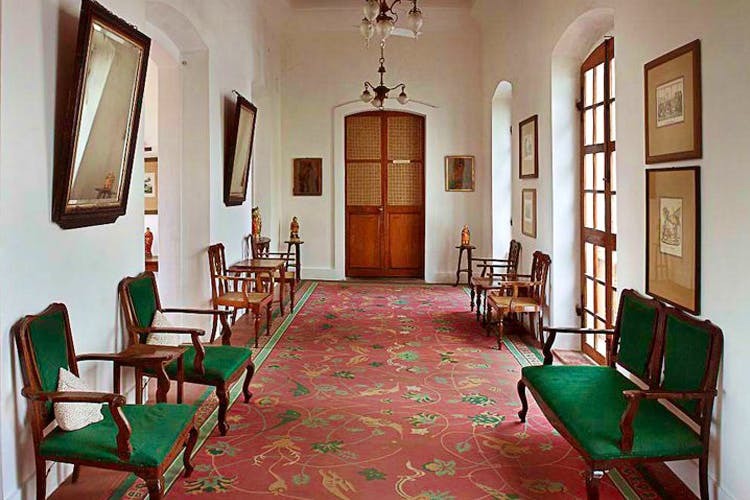 The Candernagore room is furnished with white and brown, with sheer curtains surrounding a four-poster bed, while the Surate has wooden double doors with hints of pastel lemon. While each room reflects its character, the running theme is stylish attention to detail with collector’s items and art making up the décor. We also love that the property is built around a central courtyard overlooking a resplendent tropical garden. The restaurant in the courtyard, Carte Blanche, serves a classic selection of French, Indian and Creole for those would like to savour a heritage flavour that is a mix of Indian and French. The mutton curry cooked in coconut curry or veggie curry with your pick of mushrooms, assorted veggies or eggplants is a treat. We also recommend the fresh seafood, like the prawns with mint and coriander curry, or the tamarind fish curry. Staying true to the French way, dessert is given as much importance. The roasted pineapple with salted butter caramel and homemade vanilla ice cream is the stuff dreams are made of; or choose the Cafe Gourmande, where the Chef pairs your gourmet coffee with a dessert of his choice. Some of the rooms have bathrooms that are barely concealed as part of the architecture, so depending on your company, make sure you check with the team as you book.